Visual - Visual persuasion is the best kind. Trump talks about security in terms of the wall. He leave sdetail out so you can visual your own wall. Your brain processes visuals 60,000 x faster than text. Photos on Facebook generate more “likes” and “shares” than text, video or links. New and different information is easier to remember when it is presented visually, rather than in text format. Sixty percent of people are visual learners. Publishers who use infographics realize an increase in traffic of 12% over those who don’t. Pinterest generated more referral traffic for business than Twitter, Google+, YouTube and LinkedIn combined. Simplicity - The one with the simplest plans appears smarter. Pacing and Leading - Match the person you want to persuade in some way and them lead them where you want to head. You gain people's trust by pacing which then allows you to lead them elsewhere. Fake Asset - There is a low risk to send back DACA migrants. He created a sense of urgency about faking sending them back and in return got something real. Strategic Ambiguity - He allows people to think whatever they want to think as long as it makes them happy. You cannot have a deal if both people do not think they get something. Think Past the Sale - We are no longer debating whether to strengthen the border. Now the argument is just how much. He already made the sale, tightening the border. Here's how it works. 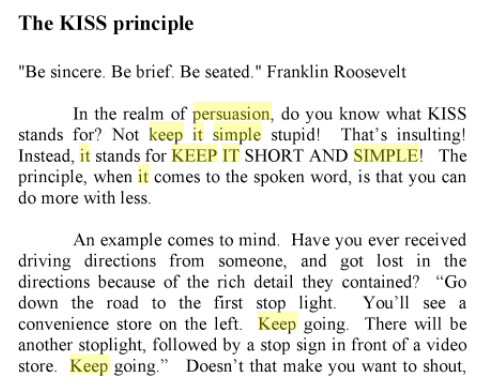 Let's say you want to persuade someone to do something they probably wouldn't do if they consciously thought about it. You manipulate them into thinking about choices they would make "past the sale," meaning taking the sale as already done. Apologies to Bernie, but it was too perfect an image not to use. The car dealer doesn't try to get you to buy a car. If you're interested, he'll start talking about all the wonderful options, so you're focused on those enticing alternatives, with the mutual unstated assumption you're going to buy the car. You hardly think about the purchase because now you're focused on whether or not to get the Nav system or the upgraded audio. High Ground - Low ground is the details, should we have a wall. The high ground is the goal better border security.